Authored by vpilo on Jan 5 2019, 10:33 AM. which makes the whole experience very confusing, as the user means to drop at cursor location. Can confirm reduced awfulness. But while you're at it, why not make it entirely non-awful? :) The problem here is the tiny tiny tiny drag area in the fake titlebar. I think the height of the fake titlebar could be increased by a factor of 2 or even 3, which would make this UI much more pleasant to use. This cursor should only be used when actually dragging (i.e. when the mouse is down), not when a drag is merely possible. For that, a more appropriate cursor might be Qt.SizeAllCursor. Also, while you're touching this, I bet it would be really simple to fix https://bugs.kde.org/show_bug.cgi?id=399992. And it might already fix https://bugs.kde.org/show_bug.cgi?id=365254 due to the lowered opacity. 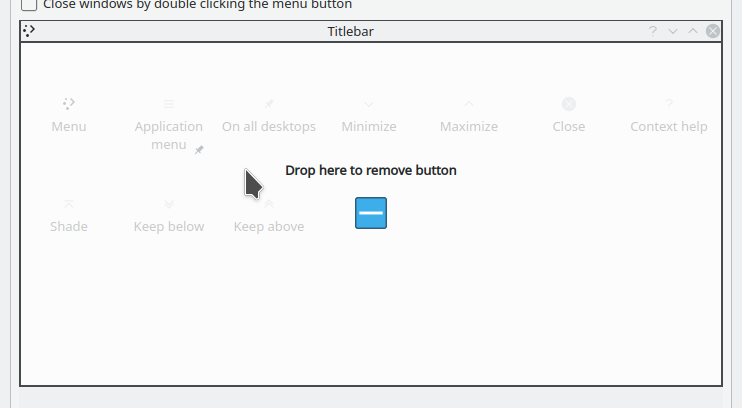 Improving the UI like I suggested would probably also be enough to fix https://bugs.kde.org/show_bug.cgi?id=350122. This comment was removed by vpilo. re: 365254, I think it could look better with arrow-down instead. Thoughts? The problem is that the entire UI is a mess; I had initially that target, but couldn't really make it work. But thanks to your suggestion, I noticed that doubling the titlebar and buttons drag&drop is much better - I will fix it all in another patch (too many changes here already). It still makes sense to calculate this from the icon and text like before. I'm adding that, looks nicer than now. Without this, the top border of the fake window is double thickness, since it's actually two borders (the whole window + the titlebar). I couldn't find less depressing way to fix it. How so? From kcm.cpp via a property? Or the TextMetrics QML type? Maybe medium would be more appropriate here? smallMedium is a bit, well, small! I could not use TextMetrics; it was not accessible outside of the Delegate and useless when associated to the dragHint (that's why I just used dragHint.implicitHeight). Did you mean something else? Re: cellHeight, the easiest way I found to have it look decent is letting QML do the job - I tried A LOT of different ways, something always got messed up. Yeah, the QML for this particular tab on the KCM is a little more fragile that I think anyone would want. These changes seem sane within the existing constraints and I can verify that they fix all the bugs listed in the summary section.